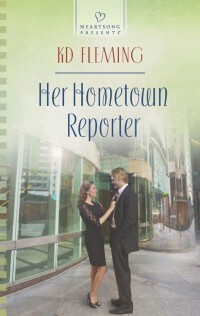 I’m sharing some tips on Romancing Your Readers Like a Romantic Comedy in celebration of Her Hometown Reporter releasing May 1st. So, jump on over to Seekerville with this link http://www.seekerville.blogspot.com/2015/04/romancing-your-readers-like-romantic.html and share with us your favorite romantic comedy or your favorite couple from either a book or rom-com. My “to be watched” list is growing and growing. I can’t wait to see what your favorites are. And here’s a little teaser from the inside cover of Gina and Toby’s story. He’d shaken her trust in him. Gina wasn’t willing to tread a path that could collapse beneath her feet. And believing Toby’s story was too big a hazard. He’d made her care about him. She wouldn’t give him the power to break her, too. “It’s a nice story. Almost as touching as the one you wrote about the senator and the prayer journal. But I can’t afford to believe you. Trust isn’t part of a five-year plan. It’s a commitment, a loyalty that lasts forever. And I’m a forever kind of girl. You’re a short-term kind of guy. It was fun fighting with you, but then, it was all just a game to you wasn’t it? Congratulations, you win.” She kept her eyes open against the cold sting of tears, knowing that if she blinked they’d escape, and then he’d know how much he’d almost won. When I needed to know how to write a good blurb for my stories in the Sparta series, I had a hard time finding specific helpful hints on how to do that on-line. *One Caveat I will offer, it is usually easier to write the blurb before you’ve gotten very far into the manuscript because it keeps you from getting “lost” in the details. But write it when you need to and go from there. Definition of a Blurb: A blurb is the back cover “teaser” that lures a reader or an agent/editor into wanting to buy/read your book. Your blurb can usually be used as your pitch in your query letter or when you are doing an actual face-to-face pitch session with an agent/editor. A blurb contains the overall premise of your story without giving away specifics. Homework for you: Visit a bookstore or go on-line and find 10 books that are within the same subgenre as your story. Read each back cover blurb. Count the # of words. Total the number of words from all the blurbs and divide by 10. This gives you the average # of words your blurb should contain. It is a guide–not a rule. But if you look at the blurbs of those books, it will give you an idea of what your blurb should include and how long to make it. A blurb is not a “just the facts” recitation of the highlights of your story. The blurb should be written using the same tone/voice that you use in your story–so don’t even think about getting someone else to do it for you. And no, writing the blurb is not easy–Trust me. 1. You know the average word count. Stick as close as you can to it. 2. You have 2 choices on POV here. You can go for either the hero or heroine‘s POV or you can tell the blurb in both of their POV’s. 3. Define your character. (not their name or how they look.) WHO are they? ex. Josie is a scientist with OCD, raised by hippie parents. Paint a picture of your character by word choice and remember you only have a limited # of words to use for the entire exercise. 4. What does your character want? 5. Why can’t they have it or who causes them to not be able to have it? Usually this will be the other main character. 6. What can these characters lose if they can’t resolve their differences? This is the theme of your blurb. Heroine has to learn how to let go and trust others while the hero has to learn patience or that there are other things in life more important than the goal he started out trying to attain at the beginning of the story. Word Count on Blurbs–Not etched in stone, just a suggestion. For a 70,000-100,000 word story, word count of the blurb can be up to 300 words (again, check out blurbs of actual books within your subgenre). For examples of blurbs in the 200-250 word range, take a look at my page titled My Stories on this blog. I hope this post is helpful to you and saves you some of the angst I experienced when I was looking for direction in how to write blurbs. Please leave a comment and let me know if you found this post useful. And let me know if there are other areas of craft that you would like to see addressed here. I’ve taken this class and it was amazing. I learned so much about how to more effectively develop my characters and show their growth on the page so my readers can feel more connected to the character and be drawn further into the story.